it’s been some time since my last post. Unfortunately, work has had me in a firm grip since the start of the year and February & March were especially intense, thus the long time without any post. I did tangle a bit here and there but mostly I was simply too tired to work on the Diva Challenges or even publish some posts that I had already written in January (and which are still waiting to be published). However, I think that these extreme times are over and that there’ll be more life in the near future. Tangling on top is a little hard sometimes since the colour seems to clutter the tip of the Micron a bit, but with a little patience it works just fine. I also think that it’s a perfect match with my latest favourite pattern, Ginili. Isn’t it a wonderful pattern? This next piece I did for my mother’s birthday. My sister and I gave her a trip to Berlin this year since the International Garden Exhibition will be in Berlin this year. The picture is part of our gift certificate (that’s why there’s a lot of empty space at the top). I like the picture overall, although Zinger looks a little blocky here. But I guess it’s ok since I was a little under time pressure and finished it at 3am on the morning I had to send it over to my sister to finish it. 😀 I really like Garlic Cloves here, it’s a great pattern to use for “gardening textures”. The background was done with watercolours. 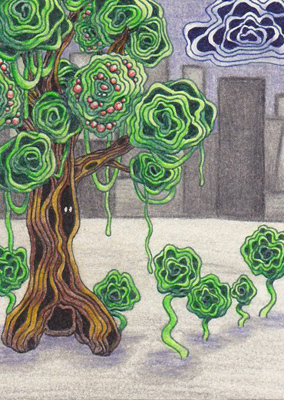 I then tangled on that background and shaded with Polychromos coloured pencils. Shading was a lot of fun here! My latest piece is a traditional tile and I really love how it turned out! It all started with Auraknot, then Ginili joined in and the challenge was to connect both of them. But Hollibaugh (here with dark and bright “strands”), some smaller Auraknots and Printemps did a good job here, I think. Shading the small Auraknots was a challenge though. But if it’s larger, it doesn’t get any easier, too, and I guess I tend to “overshade” it. I’ll have to do some research how everyone else is shading it! It’s always great to see how others are shading or tangling a particular tangle. That’s it for today, I hope to see you here again soon! Diva Challenge #246: Save the Trees! Theoretically, I didn’t have the time for this week’s challenge (I urgently have to tangle the new blog header for winter! ), but this week’s challenge really spoke to me so I HAD to squeeze it in before doing other stuff. The challenge #246 was issued by India’s first CZT, Dilip Patel, who asked us to choose only one tangle of our liking and to tangle a tree with it. I decided to tangle an ATC and chose Diva Dance for my tangle because I love it and think it’s a great tangle for creating bark and foliage alike. However, I’m not sure if my contribution ist really a monotangle because I drew the city in the background.. But I do hope it counts. 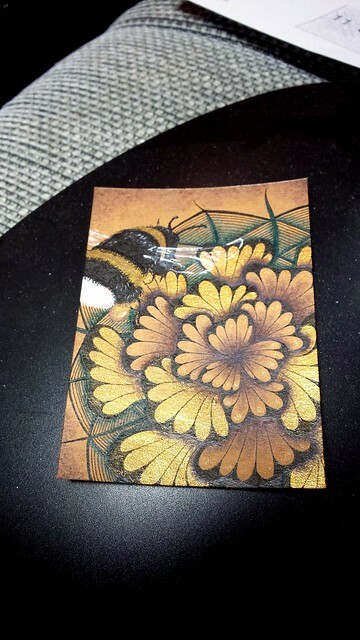 This ATC was drawn with Sakura Pigma Mikrons in Black, Blue and Green as well as Faber-Castell Polychromos coloured pencils. Although the calendar has taken up a lot of my free time (and will still need my attention after the end of next week when the calendar should be sent to the recipient), I still took the time to tangle a bit. 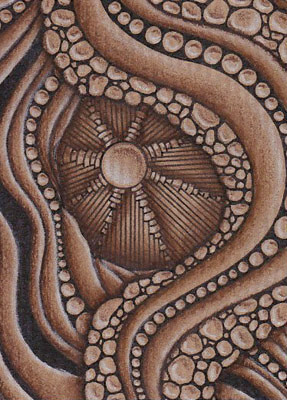 Still no other challenges or the continuation of my “One Zentangle a Day”-project, but something I’d like to share with you, tangled ATCs (Artist Trading Cards for all those who don’t know them) on brown paper. It was such fun to tangle on brown paper! 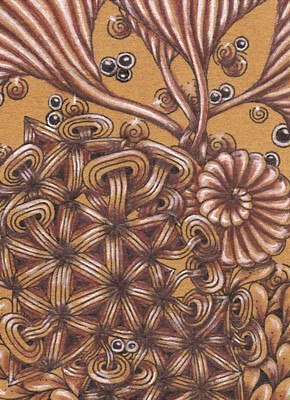 I used the “standard” black Sakura Microns for the tangles and for shading a Faber-Castell Polychromo in Burnt Umber. The highlights were drawn with a Polychromo in Warm Grey !. The two pictures’ tonal value looks a little different, but that’s only because the brown paper is unfortunately quite hard to scan… and I’m lousy at finetuning the pictures. But I guess that’s okay. I’m still afraid to say that the truth lies somewhere between both pictures. 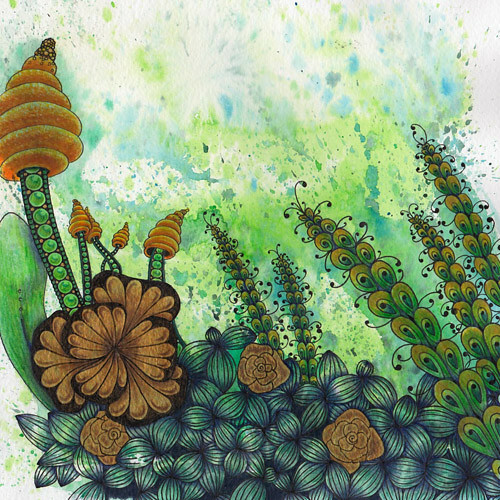 And here is the second part of my little retrospect on my Zentangle-inspired art (ZIA), this time from December 2012 to March 2013. All cards have already been traded! I hope you like my work! Starting from the next post there’ll be pictures of more recent works to see. Hope to see you then again! 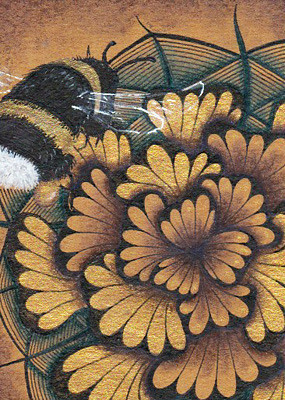 Here I’ll showcase my small works of art and my thoughts and ideas about other stuff, too – most of it probably on Zentangle ®. My art is small, because I’m mainly drawing Artist Trading Cards (ATCs), which are 2.5 x 3.5″ or 6,4 x 8,9 cm respectively. But I also enjoy tangling regular a Zentangle or a Bijoux tile. For someone as impatient as me these formats are simply perfect because they are finished in a short time! 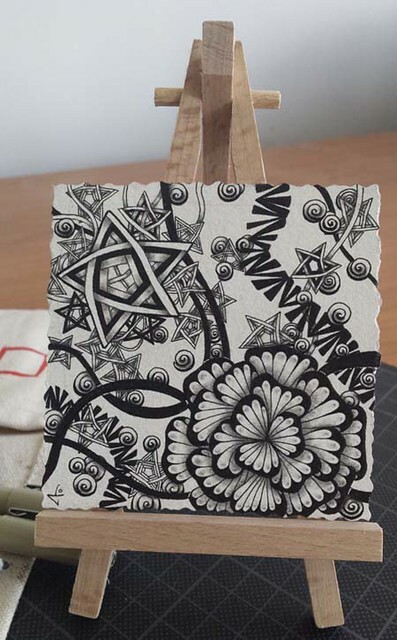 In August 2011, while browsing the internet, I stumbled upon Zentangle, a creative art form coined (and copyrighted) by the Americans Maria Thomas and Rick Roberts (you can check out their blog here). In principle, this art form is about drawing repetitive patterns (called “Tangles”) which leads the drawer into a relaxing, meditative state. Since I’ve always liked patterns a lot, I got hooked quite easily. 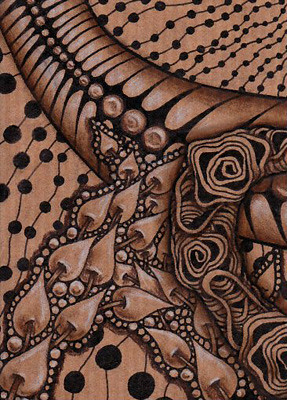 In the beginning, I prefer Zentangle-inspired Art, where Tangles are incorporated into “regular” works of art. To give you an impression of my kinds of works I’ll post a few older works of mine first before I’ll show you some new stuff.